August 22, 2016 By This post may contain affiliate links. 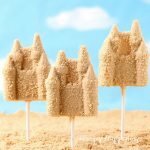 If you are hosting a beach party or even a princess party, these peanut butter Sand Castle Lollipops are perfect party favors or treats and they are super easy to make. Are you laughing at me right now? This is the final treat from the beach themed graduation party we had in May. Yes, May! This summer has flown by and I’ve been working non-stop even though you haven’t seen much evidence of that here on this blog. Last week I hosted a Fun Food Blogger Retreat for five of my favorite food craft bloggers and although the event was only four days, organizing it took months. I am working on a recap post all about the event, but just had to get this final summer treat shared with you. I’m going to just get right to the tutorial. 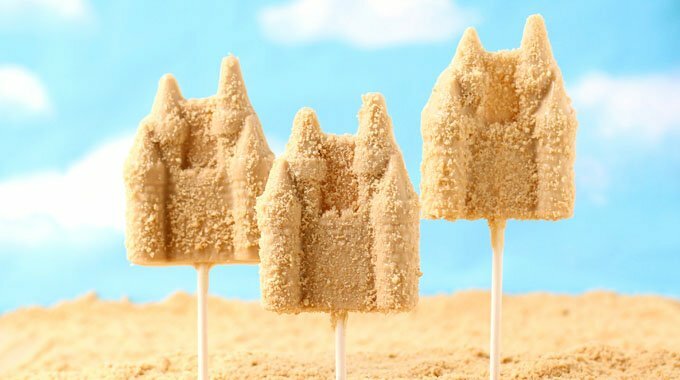 Peanut butter flavored candy Sand Castle Lollipops coated in cookie crumbs are to die for. 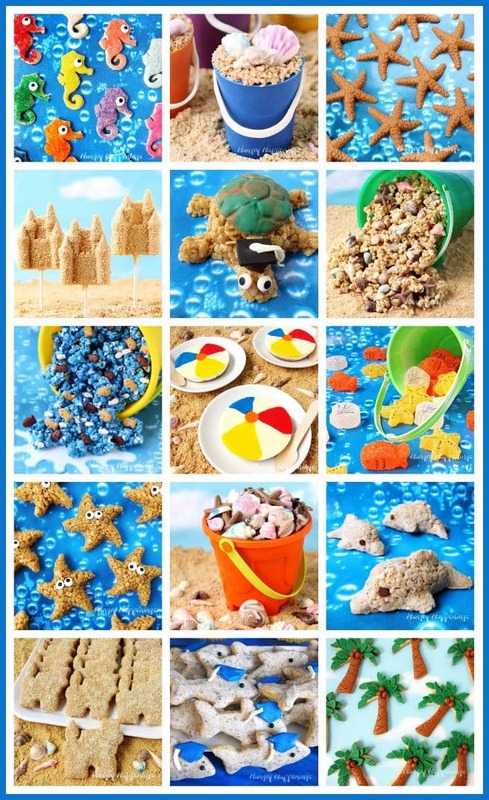 These treats are perfect for a pool or beach party and are also great for a graduation party! Melt the white candy melts in the microwave on high power for 30 second increments, stirring after each until melted. 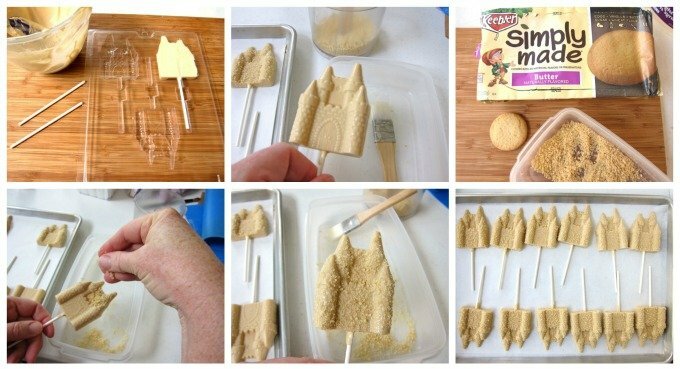 Pour candy into castle lollipops molds. Freeze for 8-10 minutes until set. Remove from freezer and pop candy out of mold. Let sit at room temperature for 15-20 minutes. Brush a light coating of corn syrup over front of lollipop. Sprinkle cookie crumbs over top. These treats are quick and easy to make. Melt the white candy melts then stir in the peanut butter. Pour into the molds and insert a lollipop stick. Freeze until hardened, then remove from mold. Let sit at room temperature for a while before brushing corn syrup or honey over the front of each castle. Then sprinkle cookie crumbs over top. Whew, I’m finally finished with the tutorials for all the treats. Now summer can officially come to an end. If you recreate these Sand Castle Lollipops be sure to link to this post and/or tag @HungryHappenings on Instagram and send me a picture so I can share it in my Readers’ Gallery. I know it’s been quite awhile since I last wrote, but you are still AWESOME. Thanks for all the wonderful recipes. Once the queen, always the queen. dang how i hate florida summer heat but stick me in one of these castles and i’m good to go! utterly cute and easy to boot :>D! I don’t want summer to come to an end, so seeing these sand castle lollipops makes me happy, not to mention how cute they are!! I’m so ready for cooler weather, but I hate to see the long days shorten. It is always hard to see summer slip away. You can use peanut butter flavored candy melts, but I like that the peanut butter adds a nice creamy texture and a good peanut butter flavor. Have fun using the mold.